PROBLEM: Pivot hole in 070-001-751 Bracket wears out prematurely. CAUSE: Poor manufacturing design. 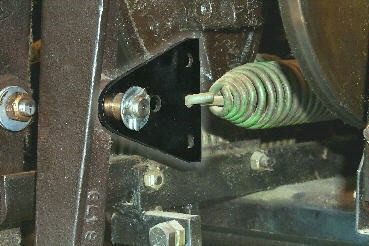 Metal bolt (070-001-587) that goes thru 070-001-751 Bracket creates too much friction, which shortens life of bracket and pin. REMEDY: Replace with 070-001-751-T "Tuffy" Spring Bracket Conversion. Eliminates 070-001-587 shoulder bolt, which is replaced by a stud bolt that is bolted solid to the spot arm. 070-001-751 Bracket with flange bushings slides over stud bolt for easy replacement. LONG LIFE: Many years of wear.